Detroit is evicting tens of thousands from their homes this year, even as it trumpets an urban revival. One of tens of thousands of Detroit homes under foreclosure. John Graham Inc.
West sits in a plastic-covered antique chair that has been in the home almost as long as she has. She was eight years old when her family moved here in 1954 and became the first family of color in the neighborhood. Fifty years later, the county foreclosed on West’s home due to delinquent property taxes. The last surviving member of her family, she now has two days to vacate the house. Detroit residents are facing a wave of tax foreclosures of biblical proportions this year. Tomorrow, the county will officially seize the titles of some 21,000 occupied properties — homes to some 57,000 people in a city that is 83 percent black — and auction them off in the fall. From New Deal housing programs to 1950s “urban renewal” projects to today’s flood of foreclosures, housing policy in Detroit has always been designed to deny its black residents the quintessential American path to economic security: home ownership. 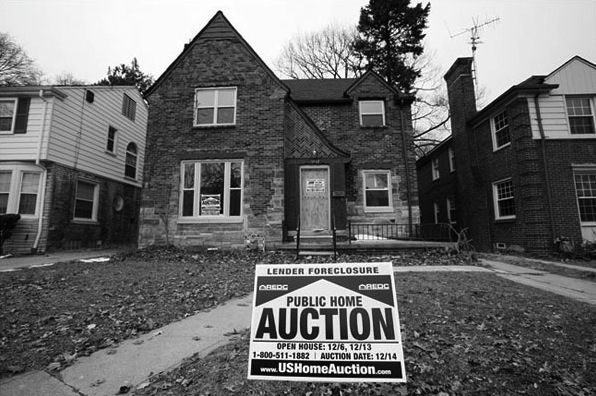 When Detroit swelled and sprawled in the 1930s, its housing expansion was largely dependent on two New Deal programs: the complementary Home Owner Loan Corporation (HOLC) and the Federal Housing Administration (FHA), which were established to financially support potential homeowners by backing, lowering, and flattening out mortgage payments. Together, the HOLC and FHA constituted one of the biggest federal investments in middle-income Americans. In Detroit and across the country, these federal dollars were funneled through a racial filter. To decide exactly how and where to allocate funds, HOLC and FHA developed property and neighborhood appraisal systems with a strong preference for “racially homogenous” housing stock. Any neighborhood with black or other “undesirable” populations was automatically relegated to the bottom of the four-tier ranking, colored red on the security map (thus the term “redlining”), and declared largely ineligible for loans. The federal investment in whiteness manifested itself clearly in Detroit in 1939, when an emerging white neighborhood began to brush shoulders with a black enclave in the city’s northwest. Even in the face of systematic deprivation, some black families were able to save enough in the postwar boom to purchase their own homes. The Wests were one of those families. They were, as they had to be, exceptional. As Cheryl describes them, they were a “family of firsts.” Cheryl’s father, a gifted pianist, was the first African American to earn a bachelor’s degree from what would become Wayne State University, and later became the first black music teacher in the Detroit Public Schools. The family went on to become the first to break the color line in their neighborhood. Thirteen years later, in 1967, Cheryl’s sister became one of the first journalists to report on the city’s uprising. The most infamous case in Detroit is the story of Black Bottom, the lower east side neighborhood named for its fertile topsoil. Black Bottom was the center of African-American life in the city for two decades — from vibrant commerce to jazz clubs to a top-performing all-black high school. In 1957, the all-white city council condemned the area as blighted and targeted it for urban renewal. By the time West turned eighteen, every single white family on her block had fled to the suburbs. When rebellion roiled the city in 1967, the auto industry was already a decade into its exodus from Detroit, chasing cheaper, unorganized labor in the rural Midwest and South. With the exit of industry, residents, and the tax base, Detroit crumbled. In 2013 the city emergency manager filed for the largest municipal bankruptcy in history. After passing through financial restructuring, some now claim that Detroit is poised for an all–American comeback story. The city government and news media across the country cheer on the rosy “revitalization” of Detroit, complete with massive urban farms and hip coffee shops. Today’s government-sponsored renewal plans bear a striking resemblance to past racist housing practices. If in the 1950s there was “urban renewal” that relied on “slum clearance,” today “revitalization” requires “blight removal.” The latest assault on black homeowners has come via tax foreclosures, in which the county repossesses and resells homes with delinquent taxes. Detroit has failed to reassess property values since the housing collapse, meaning property taxes are completely unmoored from both home prices and residents’ incomes. In extremely blighted Detroit neighborhoods, where housing prices have hit absurd lows, one year of property taxes exceed many homes’ market value. Governmental inaction has left Detroit’s residents — 40 percent of who live below the poverty line — in an economic catch-22. Unable to find work, unable to pay property taxes, and unable to sell their homes, many have no option but to leave. The county forecloses on homes after three years of unpaid taxes. True to form, foreclosures spiked three years after the crash. Between 2011 and 2014 the county repossessed 28,000 properties — homes to some 75,000 people — effectively creating an eviction conveyor belt that escorted Detroit’s mostly black residents out of the city. This year, the county is on pace to nearly double that number of evictions. While the city shows longtime residents like West the door, it is simultaneously preparing the ground for a new Motor City, with a lighter complexion. Economic titans of the city like Dan Gilbert, CEO of Quicken Loans, are pumping money into downtown Detroit, the fastest gentrifying area in the city, and leaving struggling neighborhoods to crumble. While the majority of Detroiters facing eviction owe less than $10,000, Gilbert is wooing overwhelmingly white, professional employees to move to the city with double that amount — up to $20,000 dollars per person in housing subsidies. Tonya Phillips is an attorney for Michigan Legal Services who has worked on housing in Detroit for a decade. Born and raised in the city, Phillips is wary of the messaging behind Detroit’s comeback. Black Detroiters are also being deprived of what little money the federal government is sending. In the wake of the housing collapse, Michigan received $500 million through the federal STEP Forward program to help its “hardest hit” homeowners. This assistance money, however, has been notoriously difficult for Detroit residents to access. STEP Forward Michigan has earmarked nearly 35 percent of its budget for blight removal, while simultaneously creating new blight by allowing thousands of homes to fall into foreclosure and vacancy. Despite its stated mission, STEP Forward rejects more than half of its applicants, some for being too low-income. West applied for these funds four times in 2014 to save her home and was turned down each time. Despite the abandoned properties that surround her home, West keeps her garden well-trimmed. Her home, once filled with the sounds of a bustling family of six, has an abundance of extra space. But she keeps the place immaculate, just the way her mother did. Her father’s prized piano remains the living room’s centerpiece. When she first heard her home was in foreclosure, West scrambled for support. With multiple illnesses and only a meager income from work at her church, she was in no position to pay her inflated property taxes. After being denied federal assistance money, her home was sold at an online auction for $20,000. West suddenly became a tenant in her family home, charged with paying rent she couldn’t afford. Soon enough, she received an eviction notice. Seated in her mother’s antique chair, eviction notice in hand, West reflects on her situation. Racism has always shaped her city, but until now she at least had her family home to keep her grounded. Patrick Sheehan is a teacher and writer living in Detroit.